If you thought last winter was cold, you should stay as far away from magneto-optical trapping as possible. Yale physicists recently used this technique to cool a molecule of strontium monoflouride down to 2.5 thousandths of a degree above absolute zero. That makes them the world's coldest molecules. It's also really cold! Absolute zero is -459.67 degrees Fahrenheit and is widely believed to be the lowest temperature possible. Magneto-optical trapping basically involves using the lasers both to cool down the molecules and hold them in place in a vacuum chamber. 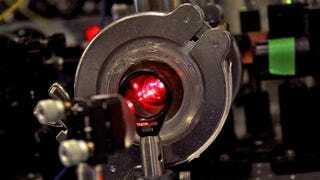 Rather than speed up the movement of the molecules, the lasers actually slow them, causing them to cool. The immediate practical uses for this breakthrough mainly apply to research. "We can start studying chemical reactions that are happening at very near to absolute zero," said Dave DeMille, the Yale physics professor who led the study. "We have a chance to learn about fundamental chemical mechanisms."